This post is sponsored by Red Star Yeast. All opinions are mine alone. 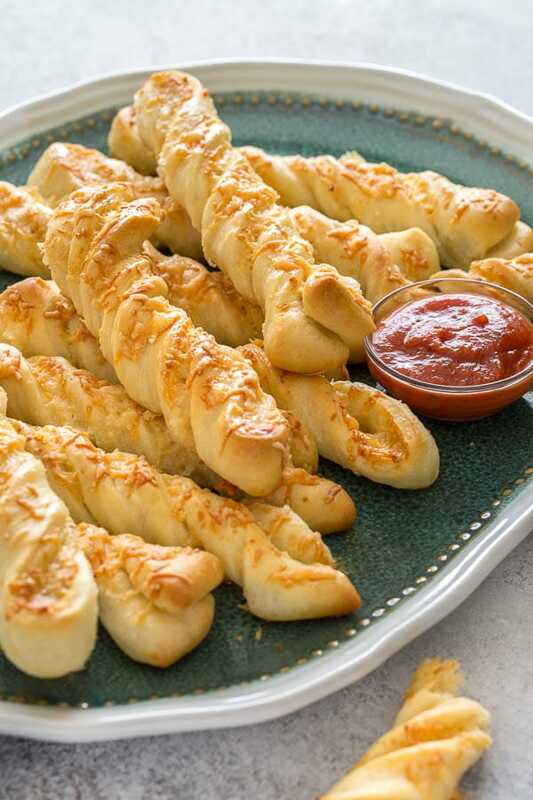 No-fail breadsticks infused with roasted garlic and laced with cheese inside and out. Unbelievably delicious, yet truly simple to make. 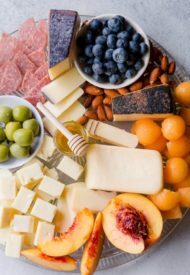 I hope you love carbs, and cheese, and garlic! Because we’re having the most aromatic, addicting breadsticks loaded with lots of cheese. But if you’re not a big fan of garlic, I still insist you give this a try. Here’s the thing. We’re talking roasted garlic here. Not spicy pungent fresh garlic. No, roasted garlic is WAY better. It’s milder, almost sweet and caramelized, super soft gold nuggets! It takes a little bit of time (mostly hands-off! ), but it’s well worth the effort. Whenever you bake a casserole, or roast a chicken in the oven, throw a few heads of garlic wrapped in a foil and roast them along. And it’s not only great for breadsticks. Smear it on a piece of baguette, or add it in your hummus. It’s life-changing! Now that we got roasted garlic situation squared away, let’s talk about actual breadsticks. We’re making our breadstick dough from scratch, which doesn’t mean it’s complicated. Believe me, it’s basically no-fail bread dough recipe. You can make the dough in a bread machine, in a stand mixer, or even just by hand. I make mine in my stand mixer with a dough hook attachment. And as with any yeast-based dough, we’ve got to start with a quality yeast. Red Star has been my go-to brand when it comes to yeast. (<- Check out their website for amazing recipes, yeast baking tips, and coupons.) I always get superior rise whenever I use Red Star yeast, and I couldn’t be happier to partner with them today. 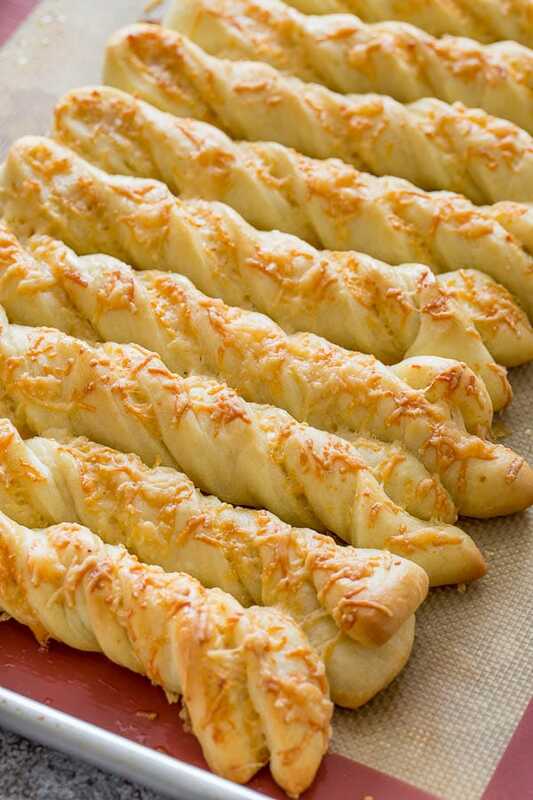 We’re using the Red Star Platinum Superior Baking Yeast in our roasted garlic breadsticks recipe. With the Platinum yeast, we don’t need to proof the yeast, which is one less step to worry about. The ingredients for the dough is super simple, and you probably have them all on hand. Again, you don’t have to have a bread machine, or stand mixer, to make the dough. And here’s a step-by-step visual for you on how I shape my breadsticks. They look fancier this way, and most importantly, cheese is twisted through and through! Don’t you just love fresh baked bread smell? The BEST!!! Once the dough starts coming together, add olive oil and knead for 2-3 minutes on medium speed. If kneading by hand, knead for 5 minutes. The dough should be soft and slightly sticky. Drizzle a little bit of oil into the bowl and coat the dough. Cover with a kitchen towel and place in warm place to rise for 1-2 hours, or until doubled in size. 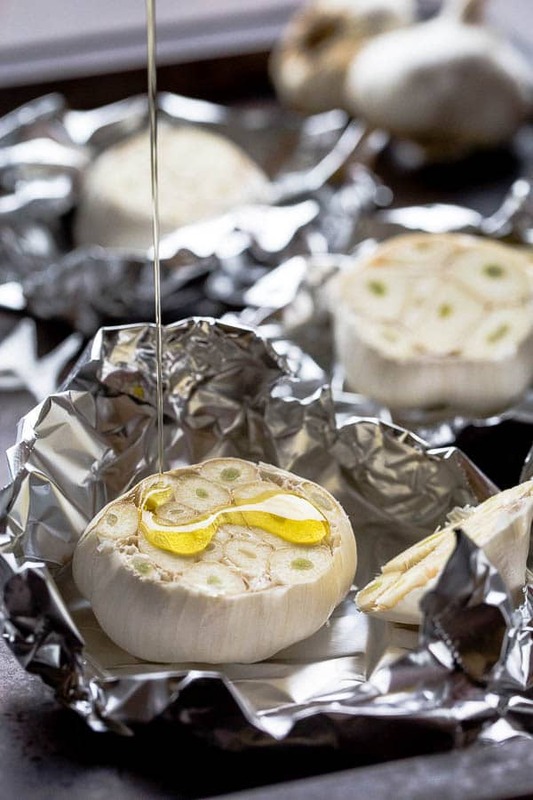 Cut the top of the garlic head, exposing the garlic cloves, and place it in the middle of aluminum foil cut side up. Drizzle 1 tablespoon of olive oil and wrap the garlic. Roast for 45-75 minutes, or until the garlic is golden and soft. Start checking it after 45 minutes, at this point it should be ready, but for more color and flavor, continue to roast for another half hour. To make the breadsticks, preheat the oven to 400°F (200°C). Once the garlic is roasted, cool it slightly and squeeze garlic cloves out. Press through garlic press into a small bowl and mix with remaining 2 tablespoons of olive oil. On a floured surface, roll the dough into 10x12in (25x30cm) rectangle. Spread the garlic olive oil all over the dough. Sprinkle about half of mozzarella and parmesan cheeses. Fold the dough in half so that cheeses are covered. 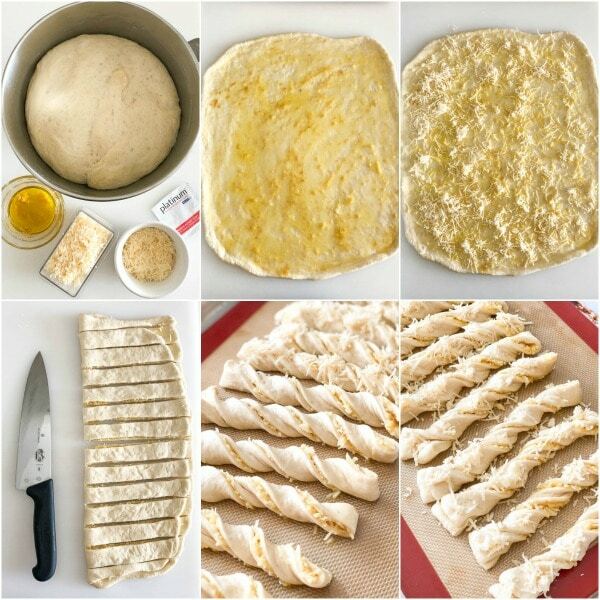 Cut the dough into 12 strips. Twist each strip and arrange them on a baking sheet lined with silicone mat, or parchment paper. Sprinkle remaining cheese over the breadsticks. Cover with a kitchen towel and rest for at least 30 minutes to rise. Special thanks to Red Star Yeast for sponsoring this post. Follow them on Instagram, Facebook, Pinterest, Twitter, Google Plus for more baking inspiration. That roasted garlic shot <3 These look amazing! These breasticks sound incredible! 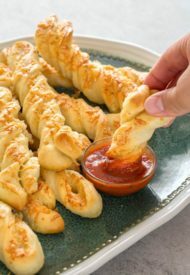 I love how you shaped the breadsticks in a twist, such a yummy recipe!! Thank you, Albert! The twist makes it looks so fancy, right? 😉 Thanks!